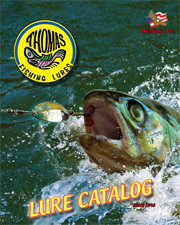 The Thomas ROUGH RIDER minnow is a baitfish imitator second to none! Jewelry quality two-tone coloration combined with an embossed half-scale pattern creates a highly reflective flash, attracting all types of game fish, especially trout, and enticing them to strike. It is also available in several bright painted finishes. With a slim profile and a heavy gauge solid brass construction, this lure is ideal for faster water conditions. The Rough Rider is also popular for ice jigging. Made in the U.S.A.